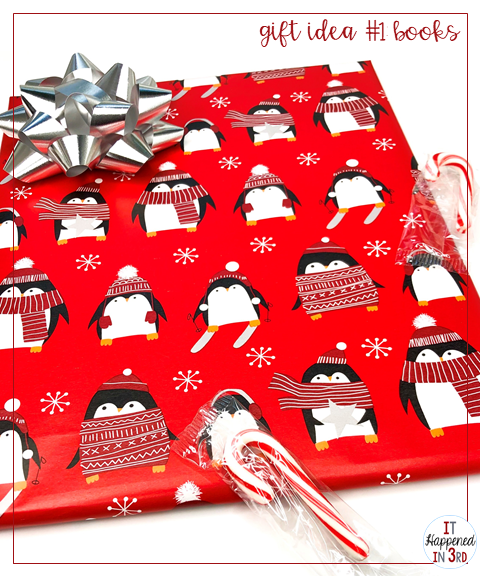 Have you been looking for simple holiday gift ideas for your students? I've compiled a list of gifts for your class that are easy to put together AND easy on the budget. Not only that, your students will love them! It may seem like books would be an expensive gift to give, but Scholastic is here to help you out! During the holiday season, Scholastic provides DOLLAR DEALS for thrifty teachers such as yourself. 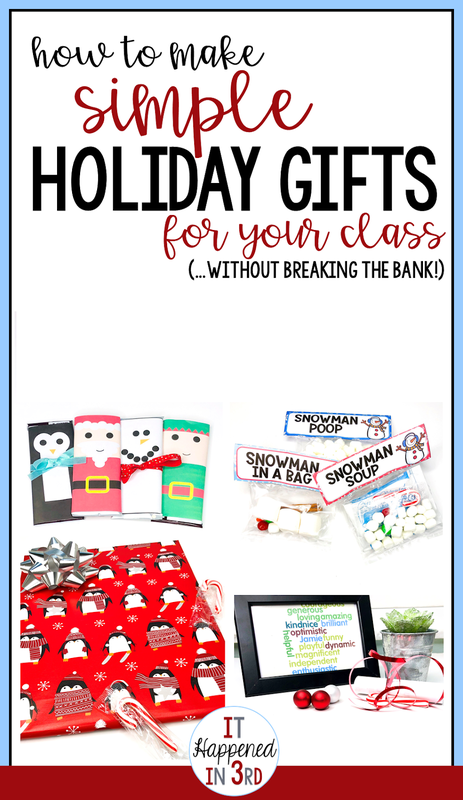 Grab a class set of these Dollar Deals, write a personal note inside, slap a bow on them (wrapping optional), and you are good to go! Really, what's better than the gift of a brand new book? Total cost: $25-30, depending on the size of your class. A word cloud is another inexpensive gift your students will love! 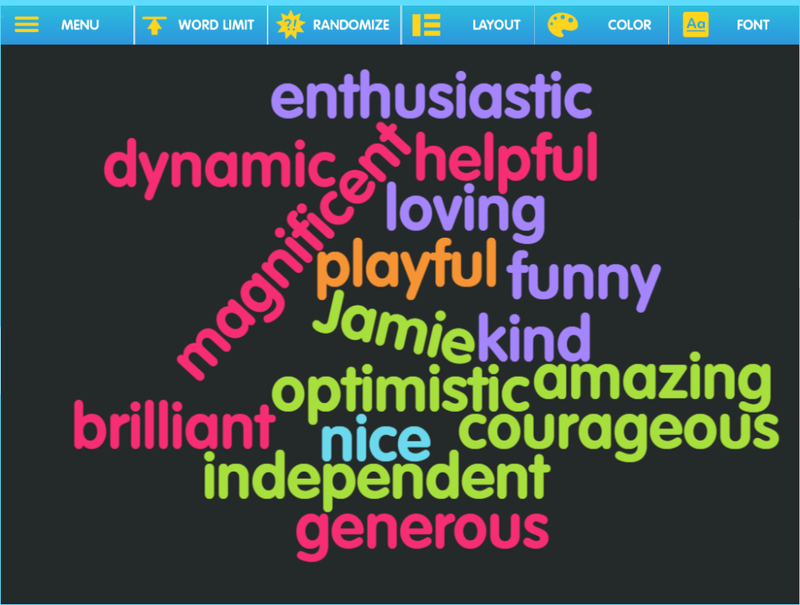 There are a lot of ways to create word clouds online. 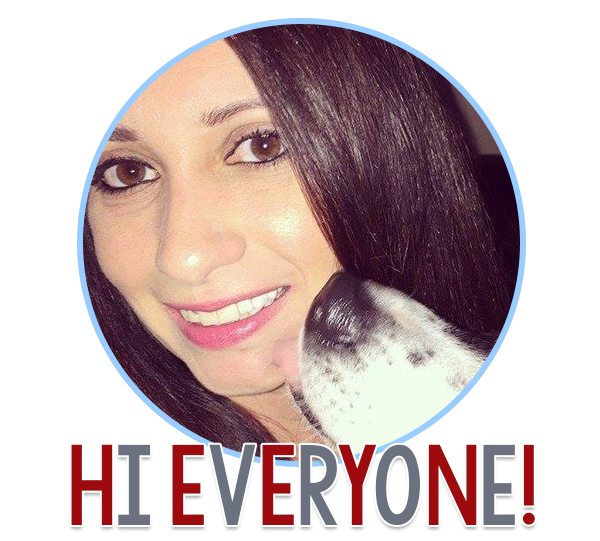 I am going to show you how to create one using ABCYA. 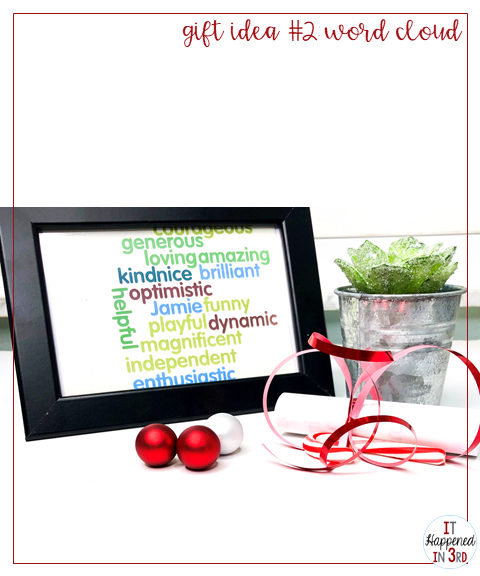 1) Before you head over to the site, open a Word document and create a list of 20-25 positive adjectives (I used this page to help me come up with words). Real talk- you can come up with a unique word list for each kid in your class, or you can use the same list repeatedly. The words will randomize each time you make a new word cloud so they will all still look unique! 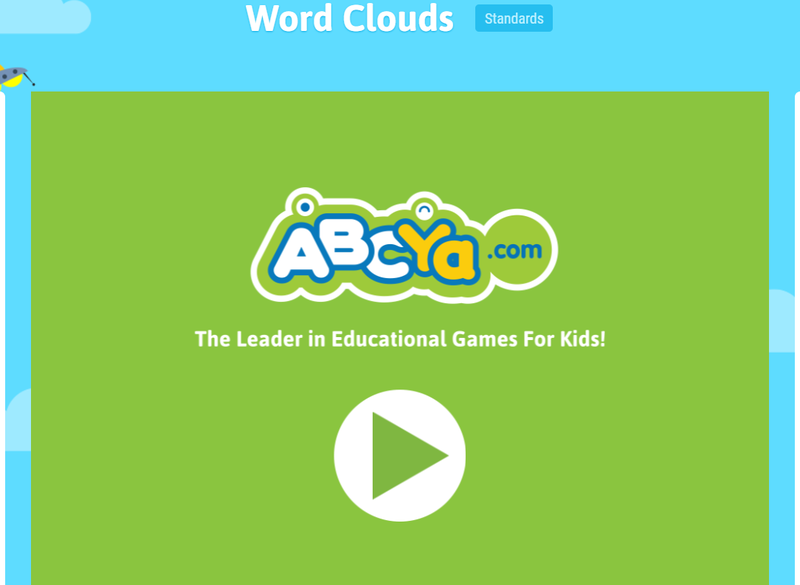 2) Head to the Word Cloud app on ABCYA and click the arrow to start. 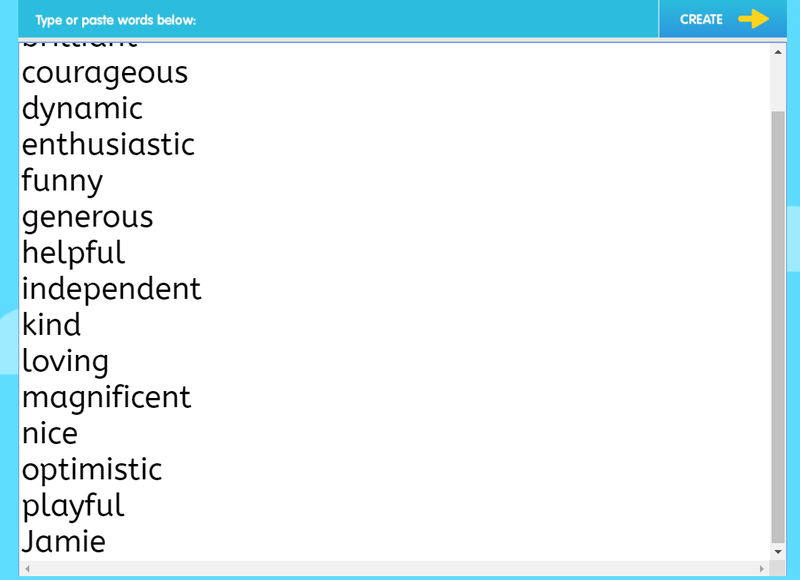 3) Paste the list you created into the word box. 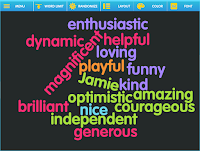 At the bottom of the list, add the name of the student you are making the word cloud for. Click "Create." 4) You will see a sample word cloud. Use the buttons at the top to edit the word cloud to your liking. You can change the color, layout, and font. 5) Pay attention to the word limit button. You may need to adjust it to fit all your words in the picture. 6) You can either print each word cloud as you go, or save them to your computer. Make sure to give each one a unique name if you save them! Print and place in a cheap 5x7 frame (IKEA and Dollar Tree are good options). You will need to play with your printer settings to get the word cloud to fit the frame. I printed mine at 50%. Print your word cloud out on nice paper. Roll it up into a cylinder and tie a bow around it. Stick a candy cane under the bow, and BAM! 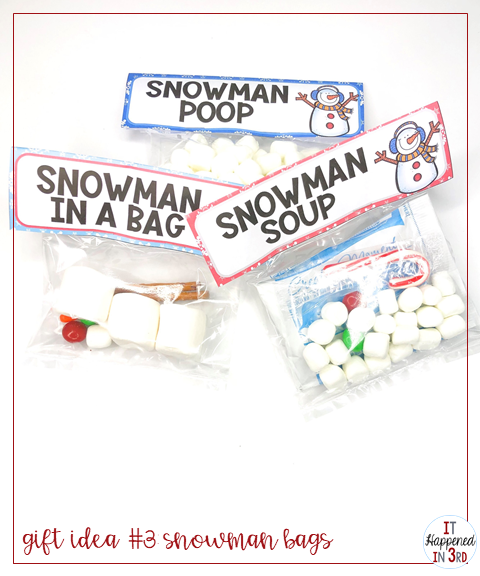 Simple, meaningful gift your students will love. Total cost: $5-30, depending on the option you choose and size of your class. 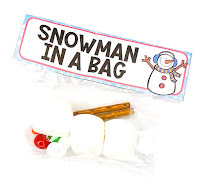 Snowmen are always a hit, and these treat bags are sure to delight students of many ages. 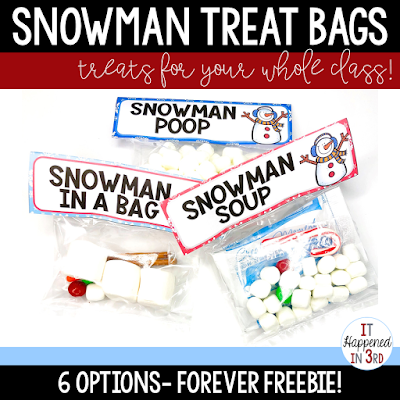 Best of all, they are a FOREVER FREEBIE in my TpT store! 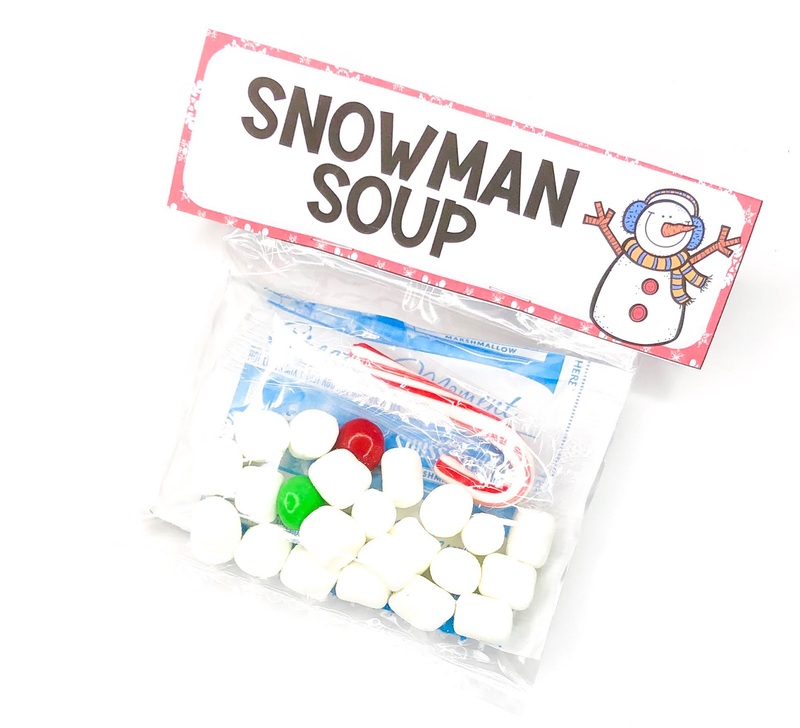 To assemble: place one hot cocoa packet, a handful of mini marshmallows, one candy cane, and one red and one green M&M into the plastic bag. 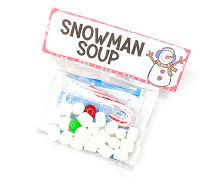 Staple the SNOWMAN SOUP bag topper to the bag. 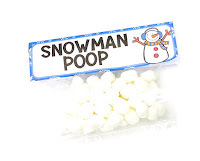 Place a handful of mini marshmallows in each treat bag. Staple the bag topper to the bag. Assemble items in bag, and staple the topper to the bag. Easy peasy! What student doesn't want to receive a full size candy bar? Plus, you get the satisfaction of handing to them on their way out the door- so they can have their sugar rush AT HOME. 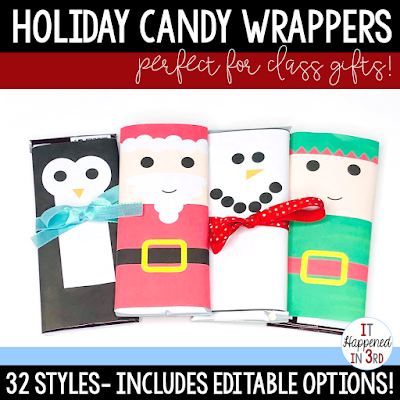 These adorable wrappers will be the hit of your classroom! 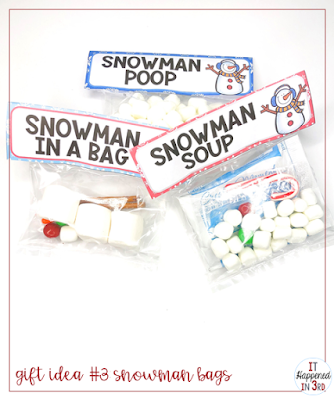 Mix and match the 4 styles available to create the perfect simple gift for your students. 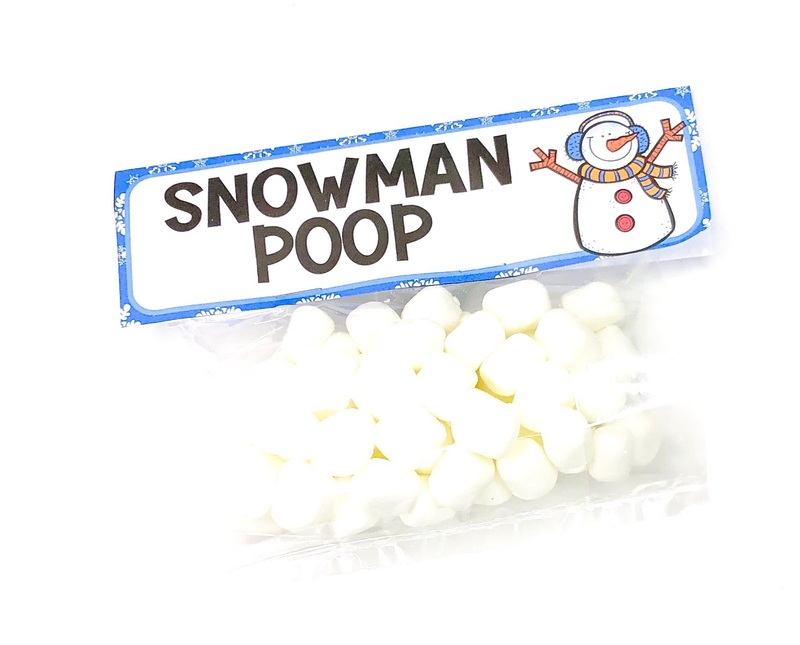 By the way, did I mention that these are editable? 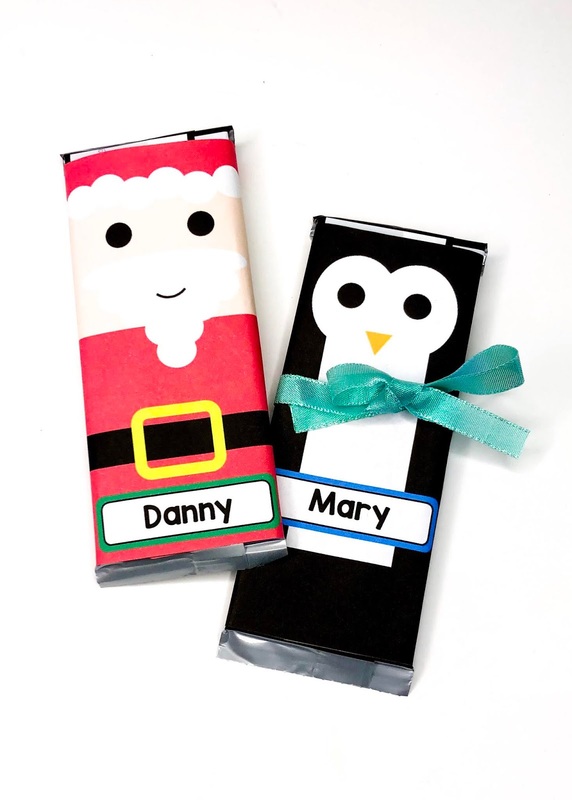 Just by adding a text box, you can customize your wrappers with your students' names, or even add a personalized message! 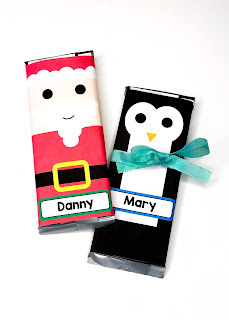 These are incredibly easy to assemble- just find the style you want, add your editable touch if desired, print, cut, and tape around a full-size Hershey bar. 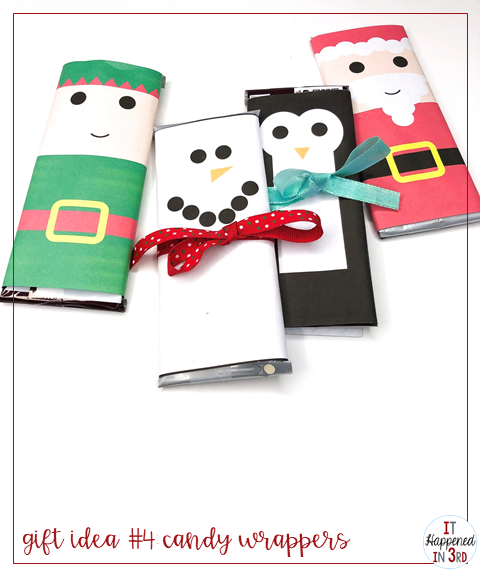 Head over to my TpT store to see a full preview of these wrappers! Total cost- $25-30 dollars- check Costco for great deals on Hershey bars! 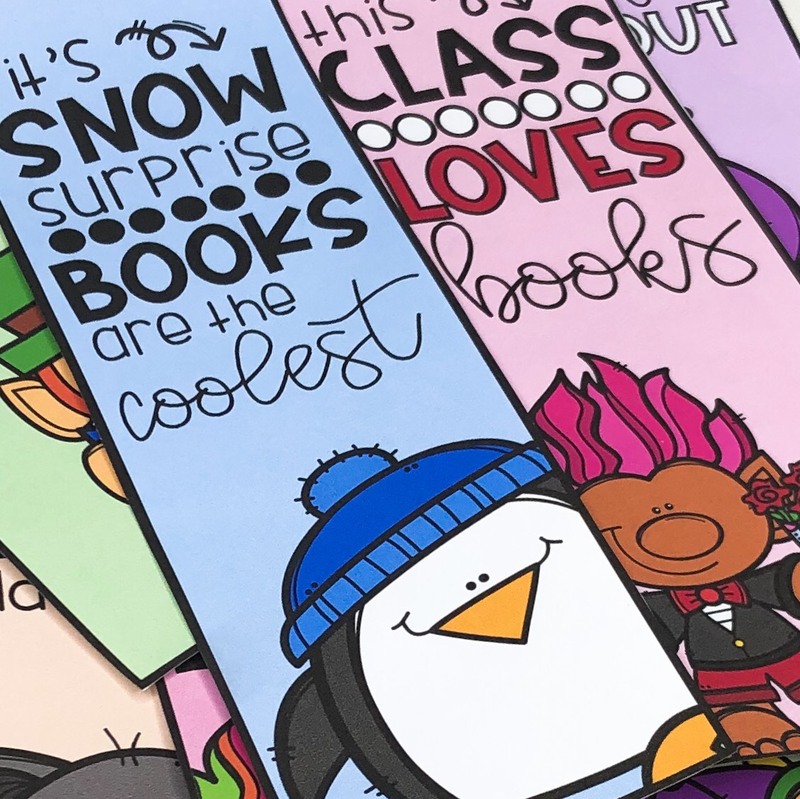 These simple gifts are sure to be a big hit with your class! 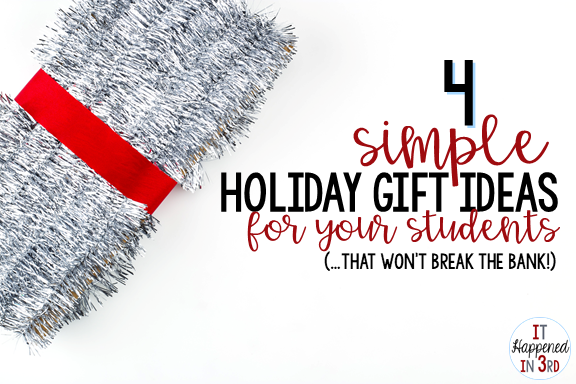 Have you used any of these gifts in your classroom before? Tell me about it in the comments!